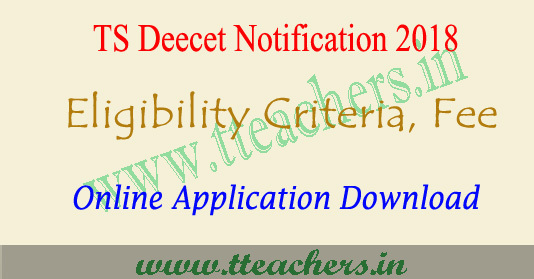 TS Deecet notification 2018, application form :Directorate of school education of Telangana to be released TS Deecet 2018 notification in the month of May 2018. 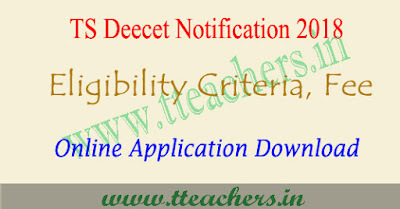 So candidates can download information bulletin on Telangana dietcet 2018 website and see the ts deecet eligibility criteria, if satisfy your self then you can go to apply online to ts deecet 2018 through official web portal tsdeecet.cgg.gov.in. Online applications for appearing at the Telangana State Diploma in Elementary Education Common entrance Test (TSDEECET – 2018) to be conducted by Dept. of School Education, Govt of Telangana shortly, are invited from eligible candidates who intend to take admission into two years Diploma in Elementary Education (D.EL.Ed) in Government District Institutes of Education & Training (DIETs) and Private Elementary Teacher Training Institutions in the state. The fee prescribed for appearing for TS DEECET 2018 to be conducted online is Rs350/- (Rupees Three Hundred and Fifty Only). Candidates can pay the fee through payment Gateway between 10.05.2018 to 23.05.2018 (Expected) and submit online application at the TS DEECET 2018 website tsdeecet.cgg.gov.in between 10.05.2018 to 24.05.2018 (Expected). B. The candidates should satisfy the Local / Non Local status requirements as laid down in the Telangana Educational Institutions (Regulation of Admission) Order, 1974 as amended from time to time. Scheduled Tribes Communities should secure 35% of marks for consideration against seats under OC/ NCC / Defence Personnel or their children and spouses / Sports category. a. The candidate should have passed or appeared for the Intermediate Examination (Qualifying Exam) or its equivalent as decided by the TSDEECET Committee for appearing at the TSDEECET 2018. However, she / he should have passed the qualifying examination by the time of admission. b. The candidates should have secured 50% of marks in aggregate in the Qualifying Examination for appearing at the TSDEECET 2018. The minimum percentage of marks in the case of Scheduled Castes and Scheduled Tribes and Physically Challenged candidates shall however be 45%. Age:Candidates should have completed 17 years of age as on 1st September of the year of admission. There shall be no upper age limit for admission into D.El.Ed Programme. TS deecet application 2018 will be available in the month of April 2018 on web portal tsdeecet.cgg.gov.in from April 2018 to May 2018. So candidates can check once application data before you submit the online application. Fee details : The fee amount for appearing for TSDEECET 2018 is Rs 350/- it will be conducted through online mode. Students can download the ts deecet hall ticket 2018 via online only. The authority to be released the Telangana Deecet hall ticket 2018 through official web portal. Candidates can download the hall ticket through the website by entering the registration No.and Date of Birth. Students can check the TS Deecet 2018 notification Results via online mode only. The authority has released the TS Deecet Rank Card 2018 after the result announcement. Candidates can download the rank card through the official website. Candidates will be invited for the counselling process as per their rank in the TS deecet rank List 2018.